No images of Solar Smart QLD and SA Installations. I had the old style wheel meters installed, there has been a lack of information from the elec retailer and the solar retailers about what will happen with the excess energy being generated by the system. My system was installed 10-8-18. The energy retailer (Red Energy) had taken over one month to even being to arrange the smart meter installation with Energex, after being advised by me of of the installation two weeks before the work was done. Also lacking was info from ALL parties on how the old disc style meters will affect power bills - until a smart meter is installed which allows the kw credits. I have been given an estimate for the current bill and probably been charged at least $100 too much and of course, no credits for the excess energy, as Red Energy say it has all 'gone to ground' due to connecting through the old style meters, and not back to the grid - is this true? The service from Solar Smart beginning to end was faultless. We were very grateful for your web site making available the quotes and also all the information which we found very helpful in making our final choice. We are now waiting for our new meter to be installed. I can't rate the quality of the system as yet. It's been on and working for about two weeks, and so far so good. We'll wait for the first bill from our supplier and then we'll be able to make an assessment on the system. I do feel that anything is going to plan and working well. 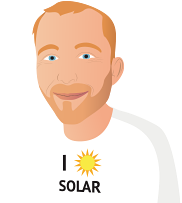 The supplier, Solar Smart, fulfilled every requirement as promised and their agent, Peter, was able to answer any question we put to him. He seems to know the business well and was very polite and respectful. We had two quotes from your recommended suppliers, the other being Halcol Energy. Their agent, Tony, was equally as knowledgeable and conducted himself in the same manner as Peter and I can't fault either of the companies you recommended. Thank you for your help in assisting us with our solar installation. SolarSmart are a very professional team and I am very happy with the installation. I purchased 24 Qcell Panels, A Fronius Primo Inverter as well as a Fronius Smart Meter which now tells me how much energy I consume from the Grid or put back to the grid. I has been a Pleasure dealing with Sue. She was fantastic sorting out any issues. She also recommended me to purchase the Smart Meter. I am glad I took her advise. Solar Panels installed on Monday 8th January. Great job guys. Thanks to Solar Smart SA who have been awesome to deal with. They quoted me a price late in Dec 2017 which was honoured in the new year without the increase in cost. Anyone looking for the best deal in Adelaide, give Damo a call or message him. We heard about you from friends who also had solar put on. We got a quote from the company you recomended to them Solar Smart. Solar Smart were able to meet our needs as far as the panels we wanted and the inverer we wanted also they were able to install before Christmas. Thanks again for your help it was extremely informative. Cannot recommend Solar Smart highly enough. Every aspect from quote through to installation and follow up post installation was first class. Very disappointed in company. Whilst i was provided with documentation for the inverter warranty, nothing was supplied for the panels. I have followed this up 3 times by email, and once by telephone and still no details have been provided. This is despite promises made that details would be sent to me. I could not recommend this company for this reason alone. It seems the only way I will get a satisfactory response is to drive to the company headquarters (about 3 hours away) to get details in person. Please accept my apologies for the delay in the issuing of the said documentation. It was an oversight on my behalf as I was led to believe that it had already been issued to you. I can confirm that the documentation has this morning (18/9) been emailed to you. I trust this meets with your approval and should you require any further information or assistance, either now or in the future, please do not hesitate to contact me. Sue at the office was friendly and got back to me quickly, Greg was happy to answer my questions and supplied additional information when required. The installation team, Chris, Rocco and the young guy with them were friendly and very helpful, Rocco even cleaned part of my gutter while he was up there. The inverter and the solar panels look neat and professionally installed and the system seems to be working as promised so I'm happy with that.